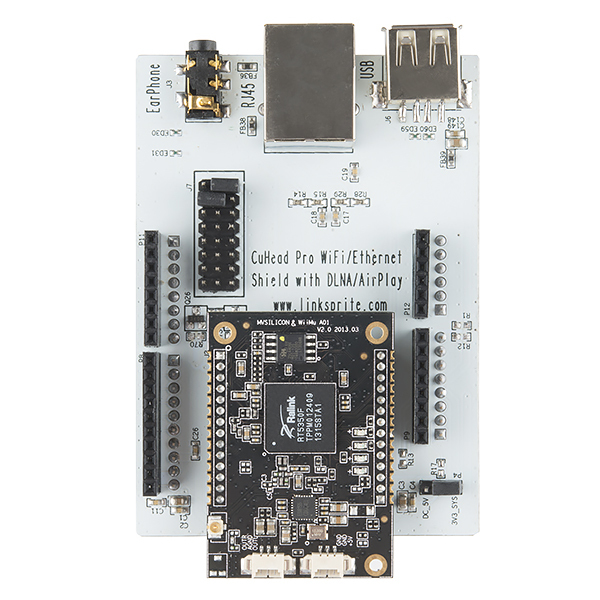 This is the CUhead Pro, a WiFi/Ethernet Arduino shield with Airplay and DLNA audio and also acts as an access point for WiFi devices. It also makes julienne fries! Alright, that last one may have been a stretch but with this shield you WILL be able to wirelessly push music and other sounds from your iOS and Android device and more. With very minimal work and programming you can have this versatile little guy up and running in no time. 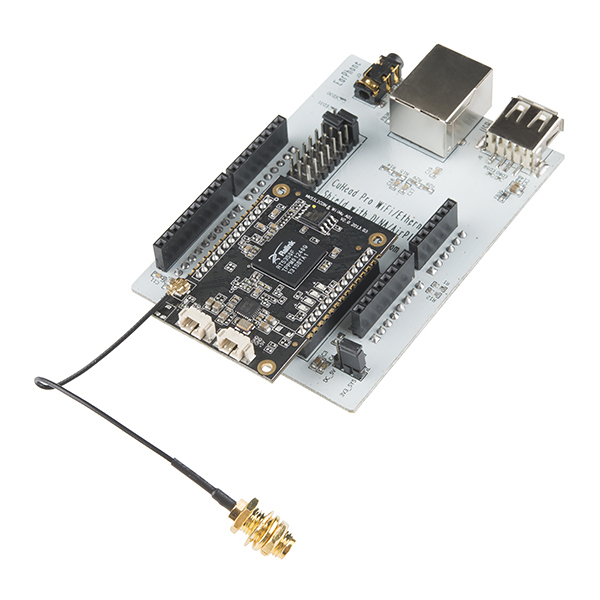 As the CUhead Pro is a shield, simply plug it into your Arduino based dev board and start transmitting. The CUhead Pro is equipped with USB-A port, RJ45 ethernet port (just in case there isn't a WiFi signal), and a 3.5mm audio jack. It is important to note that on this shield the USB host is reversed for future firmware updates. 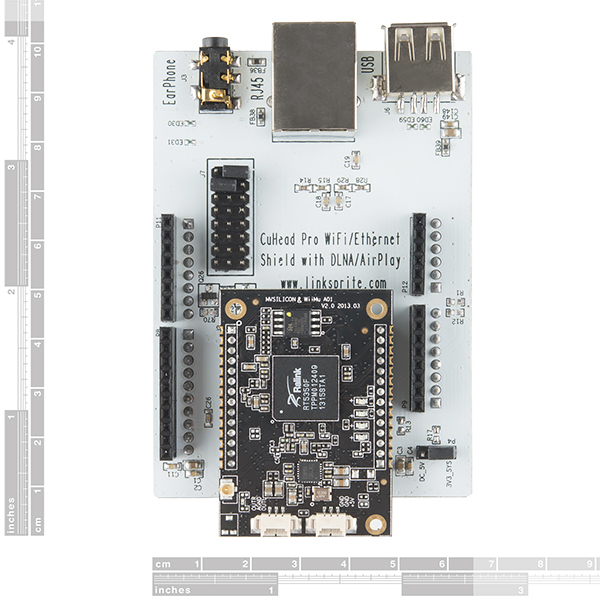 An interesting feature about the CUhead Pro is the detachable WiFi module with an RT5350 SoC chip from Ralink. The RT5350 SoC combines Ralink’s IEEE 802.11n draft compliant 1T1R MAC/BBP/PA/RF, a high performance 360 MHz MIPS24KEc CPU core, a 5-port integrated 10/100 Ethernet switch/PHY and a USB host/device. Note: LinkSprite has completed working on OpenWRT support! Check the link in the Documents section below for more information. Can this be used without the Arduino by connecting power directly to the wifi module? To answer my own question - yes. All the necessary connections can be achieved with just the module itself - Audio Out left, Audio Out Right, Ground, 5v In, Ground using the Molex Picoblade connectors. Bahaha, Lady Gaga Warning. I LOLd. There are quite a few standalone dev boards/modules based on rt5350 such as carambola and others. No info on Flash/RAM? Yun might be a better choice. Not sure about marketing airplay compatibility based on an unlicensed implementation, though. Is the Audio driver now fonctionnal in this OpenWRT port ? I've been working on it for a while; I wrote a driver for the audio chip, but can't get it to make sounds yet. It has been a long time but I am also trying to build openwrt for this module, is there any news for i2s audio support? How it is working with original image? I asked for the source code of the original one but manufacturer told me that they are not able to provide it. Is there anywhere I can get just the module? I'm not interested in arduino compatibility, but I like the capabilities of the module. Can I send UART commands to the module to control the audio transmitter (play, pause, prev, next)? Where can I find the list of commands to do that? Does the UART transmit any data when your audio transmitter sends a volume change command? I want to make a WiFI jukebox with this thing and would like to control the amplifier with buttons on my phone and control my phone's audio player with buttons on the jukebox. It would be very useful to know if you can program your Arduino wirelessly through this device. The description of comms through the UART gives me some hope that it can be done. I read the wiki. It seems to me that the CUhead Pro is more like a dedicated device, using the Arduino for power. I don't see much communication between the 2, is there? 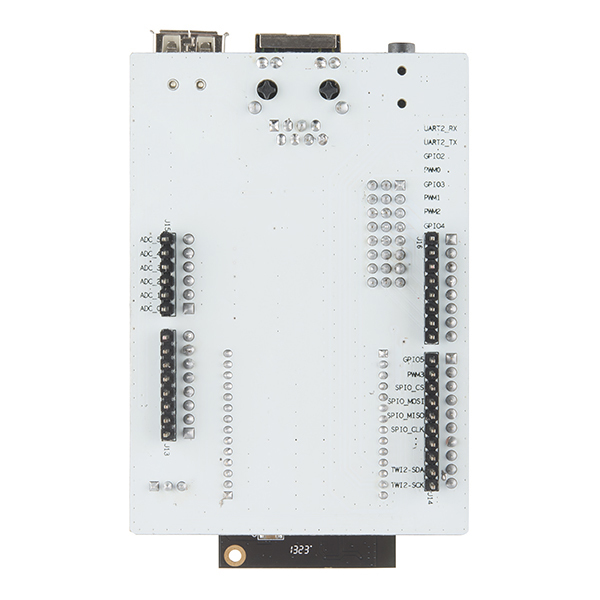 This board is similar to the Linino part from the Arduino Yun. But without all the software support (the so called Bridge library) for the communication between the atmega and the Ralink SoC. That's what I was seeing too. I think it can use the Arduino's UART to pass information back and forth. However it's quite impressive to have all that in one little device. Price is good too! Bought this thing because I am making an amplifier board for a project. Needed a good way to build Airplay function into it without having to go through some kind of external dongle. This thing powers up and works great right out of the box. Super-easy to configure it to join your network, and it immediately shows up as an Airplay device on your devices. Literally 30 seconds it takes to get up and running. It's very susceptible to power supply noise, so make sure your power supply has no audio-frequency switching noise, or post-regulator with an LDO before feeding power to this board. The DAC has essentially no PSRR, hence minus one star. The CUhead Pro does everything it says and more. 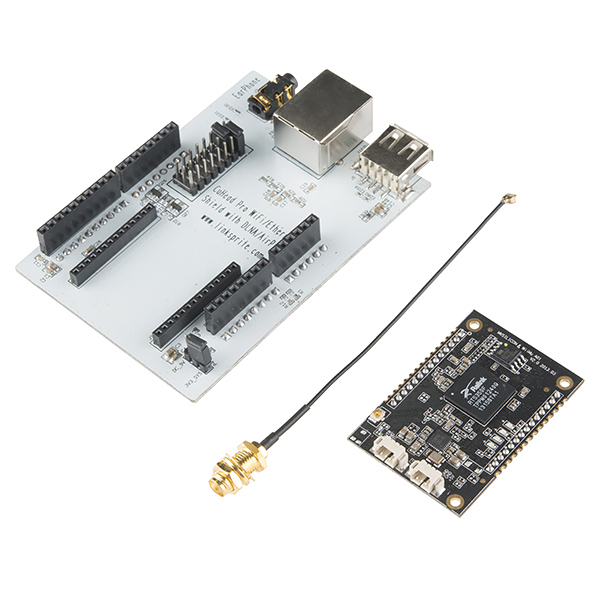 My planned use was to mostly use the wifi module without the Arduino shield, but to have the shield capability for the future, so I bought a pair of Molex PicoBlade 1.25mm connectors/wires to provide power input and audio output and a 6dBi omni-directional antenna to connect for better range. I am using this to stream music from our Android tablets to our backyard.